Anyone on campus can directly contact the University of Michigan Division of Public Safety and Security (DPSS) by using the Emergency Blue Light Phones located throughout campus. 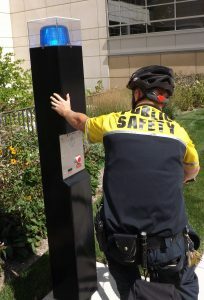 Red box emergency phones or buttons, located in campus parking structures and building elevators, also directly connect to the DPSS Communications Center. When the telephone receiver is removed from the cradle or the button is pushed, the DPSS Communications Center automatically will be alerted and an officer will be sent to the location of the telephone. No dialing or conversation is required, but if possible, try to describe the emergency to the communications officer when you call.